This first image was taken at my 23rd birthday and acted as the initial catalyst for getting back into shape! How did I get so ‘out of shape’?? I don’t actually remember that happening. I knew I put on a little weight after going to university. I didn’t know how to cook yet, but I knew how to order fast food and how an oven worked. Also beer, I knew about beer.. Come to think of it; it’s really not that much of a surprise. Okay, so I’d put on a bit of weight; I acknowledge this now. I was always fit as a child however, I swam competitively and trained every day back then. Surely I’m just one of those ‘fit’, overweight people… Nope! The floodgate was open now; I started noticing things. I got shattered having a kick about with mates; out of breath after a 10m sprint to the ball. Crap! Why did nobody tell me! I dieted for a bit (not brilliantly; I just ate a bit less). I lost a couple of stone until I deemed it ‘impossible’ to lose any more. 12 stone seemed to be the limit. Not a bad effort, but there was still a bit of a gut there I just couldn’t shift. In 2010 I took up running, and that changed. The more I ran, the more weight I lost. I wouldn’t say I was obsessed with the idea of losing weight, but I did drop down to 10 stone at one point, which was a bit silly. Also, because of my compulsion to run further and further every day, I got injured a lot. I’m now in my 3rd year of running and I think I’ve finally cracked it. The running itself is not the thing that gives you good health. It’s the lifestyle change it brings; the complete package. In order to stay uninjured, I began researching into allsorts. My diet (eating well, not eating less), gym regimes, flexibility and the fact that this is a ‘daily’ commitment; not just a couple of long runs a week and hope the rest sorts itself out. The great thing about running is the focus it gives you. I’m not even doing this because I ‘have to’ now, I’m doing it because I ‘want to’! What was I talking about? Oh yeah.. I’m turning 30 next year and I couldn’t care less! It may well be the case that I’m getting older, my hairline has gone back a bit and I remember things like ‘SMTV Live’ on the telly back when there were only 5 channels. Actually that last one was well good; they should bring that back! 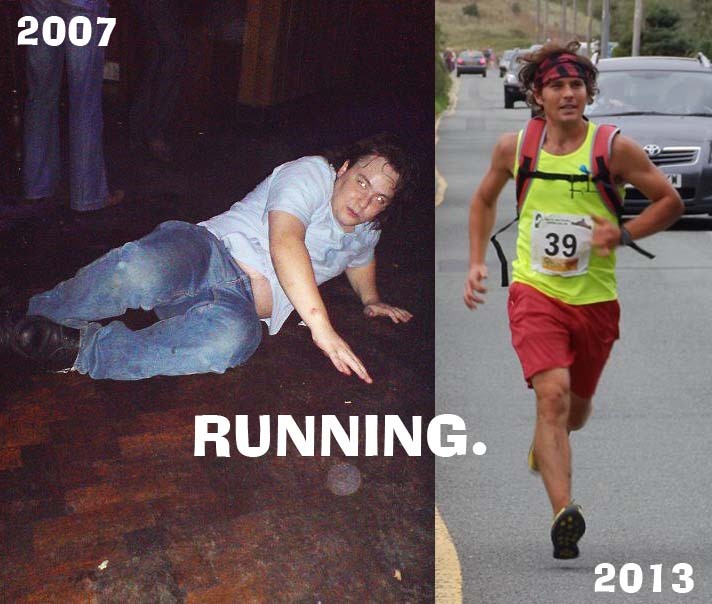 … Anyway, I think overall I can safely look at my ‘2007 self’ and acknowledge happily that the ‘2013 me’ is winning in every conceivable way..
4 Responses to Running VS Age! Hey Dan, nice site and a good read. We might have told you about the getting flabby if we ourselves weren’t also getting flabby, so to speak. Try not to die from the ruiner being positive about something! Hey Alex, good to hear from you! Yeah, this is true. We were none of us athletes back at Bradford. Good times though!